Forgot to post this so it is retrospective. On Thursday I paid a visit to Fudges Cycles on the Harrow Road on my Dahon. Took a short cut through Kensal Green cemetery. Lots of Brompton's in stock and it brought home yet again how much I am looking forward to getting mine. (About twoish weeks, I hope)! While walking the bike around I stumbled upon the burial location for Brunel. There are lots of very famous people from the Victorian era buried there. 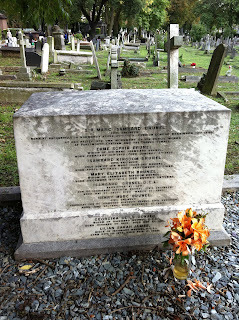 I was telling someone about where I'd been and they told me that the great Mary Seacole herself was also buried there. Totally gutted that I didn't realise this as I would loved to have seen it. Will definitely return at some point. Today I also placed an order for the Brompton battery lights. 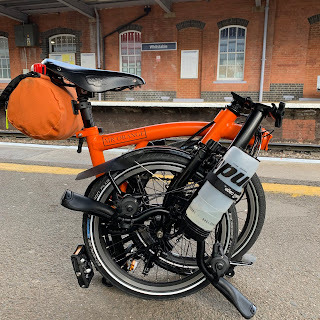 Have seen these on a few Brompton's and the rear light in particular looks really great. Got them online from 'Brilliant Bikes.' They really are a great company for all sorts of bike bits and deliver really quickly.